Chef Seng was born in Laos and fled the country during the Vietnam War. During her stay at a Thailand refugee camp of Nakhon Phanom, she learned how to cook from her camp neighbors and elders. At the age of twelve, she was the eldest of five and took on the role of caretaker of her four younger siblings in order to support her working mother. In 2009, at the age of 40 she decided to go after her greatest passion, cooking. She took over Padaek, previously Bangkok Golden, in 2010, a Thai restaurant where she slowly added Lao dishes of her own, currently the restaurant offers both, Thai and Lao menus. 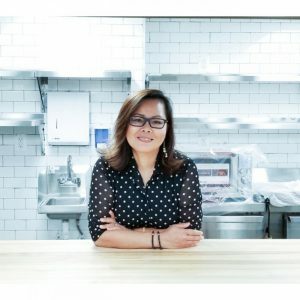 In 2014, she opened Thip Khao, a Lao restaurant in Columbia Heights and home of the Lao Food Movement. Thip Khao has been named one of the top 50 new restaurants in the US by Bon Appetit Magazine, Michelin Bib Gourmand 2016. Chef Seng was also featured on TV at NBC Washington DC and was covered in many news articles, such as the Washington City Paper, Eater Magazine, and Washington Post. Chef Seng was named the Eater Awards 2015 Chef of the year, and 2017-2018 James Beard Award Semifinalist (Best Chef Mid-Atlantic). Chef Seng is currently opening a third New Lao Restaurant-Bar, Hanumanh, coming up this Fall 2018.